The internationally acclaimed Jazz Ambassadors of Washington, DC will continue its long tradition of presenting free public performances when it appears at The Pullo Center on Sunday, December 6, 2015 at 3:00 p.m. The Jazz Ambassadors’ concert in York, PA is sponsored by The Pullo Center and Apple Automotive. 1969, this 19-member ensemble has received great acclaim at home and abroad performing America's greatest original art form, jazz. 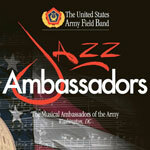 For additional information about the Jazz Ambassadors’ performance in York, PA, please contact The Pullo Center at 717-505-8900 or visit ThePulloCenter.com.